Building a better USB cable isn’t easy, but we did it! 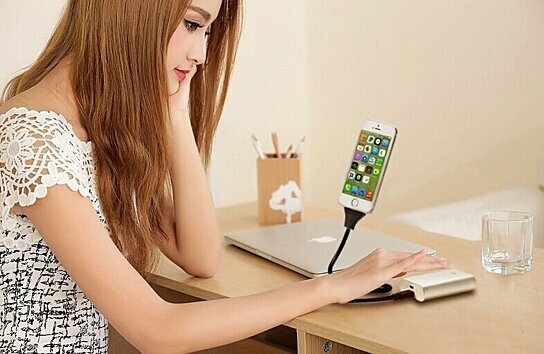 Ours is a flexible gooseneck cable that keeps the iPhone (any Iphone & Android) in an endless number of positions at home, at the office and in the car. One of my favorite parts about this cable is that it works plugged in or as a stand wherever it’s needed. It charges and syncs the Iphone/Android when connected to a computer, and can charge from any USB port. The cable is sturdy enough to support landscape mode, which is a nice touch for photographers and anyone who wants to use this in their car. A must have and a great unique gift!